The Cripple Creek/Victor area was important in Colorado’s mine history. Saturday, July 21, we took a tour of the Cresson, a modern day surface mine located near Victor. Three days later we learned how they mined underground in 1891 when we visited the Mollie Kathleen Gold Mine in Cripple Creek. By seeing both, we found it a great way to learn about the history of this occupation. While looking for elk in 1891, Mollie Kathleen Gortner spotted a rock formation that turned out to be gold in quartz. She became the first woman to file a gold claim in her own name in Colorado. It wasn’t easy to do since women in mines were considered bad luck in those days. When she was turned down, she snatched her claim papers from the claim office, stated her husband was an attorney, and walked out. Other than a government-ordered break during World War II, the mine operated continuously until 1961. It’s now a tourist attraction offering one hour tours. It’s a walk most of the way except for a brief tram ride. Temperature is around 50 degrees so it’s wise to take a jacket. for five) one thousand feet down to where we started to learn about the mining methods used to extract gold from this mine. At the first stop, our guide, Dave, demonstrated the various jack hammers and drills they used and covered the evolution of lights starting with candles up to wet cell lamps. At station two, Dave explained how they loaded broken rock (muck) into the ore carts. Manually it took one ton an hour. When they switched to a rocker shovel mucking machine, they handled two tons of rocks in 45 minutes. It was at station three, we saw an ore cart. Originally burros who lived in the mine pulled these carts. In 1934, President Roosevelt said no more of that and the burros were removed. It slowed things down. One burro could pull three carts. One man could tow one cart. This is the spot where Dave demonstrated some of the equipment miners used - a very noisy liner column drill; jack tank; and the jack light drill. He also explained how they used to blast. On our fourth stop, he briefly reviewed the mining process. The Cripple Creek District was 4x6 miles with some mines connected. The men would find a vein surface, drop down, then crosscut back to where the vein was. They followed where the vein went, collected the ore, and put it into a chute where it flowed to the ox cart. Then the rock went to the mill to be processed and the gold separated. The calaverite was a combination of telluride and gold. At this point, we each received a rock sample to take home. Looking around at this stop, I spotted several minerals. Lots of copper, rust from iron, sulphur and magnesium line the mine’s walls. Not all of the gold has been removed. Dave said 80% of the gold is still present but it would cost tens of millions to start up all the mines today. So it’s a matter of economics. We learned about processing. Ore was crushed to the consistency of gravel. It was then heated to 218 degrees. They precipitated gold and silver this way. At this point, a tram took everyone to the Black Diamond Crosscut where a tool room exists. They used to have such a room at every level so the men were never without sharp tools. At this crosscut, the tour company blasted through so the tour could continue. Upon doing this, they found gold which made national news in 1973. This is also where displays on various area mines - their mineral specimens and signboards -exist. Dave related brief information on several of these. For example, we learned about Spencer Penrose’s mine the Collect on Delivery (C.O.D.) It produced 850 ounces of silver and five ounces of gold. 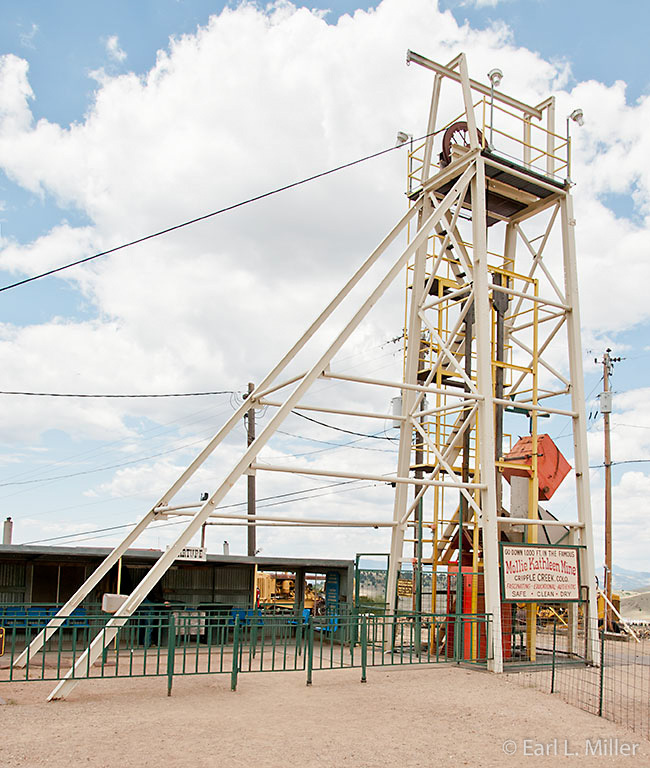 The El Paso Mine had more than 33 miles of underground diggings. The last stop was about signals. For the men to go down or to be raised, a certain number of bells were rung. Originally each mine had their own signals. J. W. Stonehouse established a set system of signals which was accepted by the Bureau of Mines in 1913. These signals are now standard for the entire world. At the Mollie Kathleen, the men mined at 700 feet for six years. They then went down to the thousand-foot level. Tours are pricey. It’s $18 for adults with no discounts for seniors and $10 for children ages 3-12. From mid May to mid September, tours leave every 30 minutes from 9:00 a.m. to 5 p.m. From mid September to the end of October, they run hourly from 10 a.m. to 4 p.m. The mine is located at 9388 Route 67. There is a place to order fast food on the property and eat at picnic tables. But the prices are high. For example, a hot dog costs $4.50. We headed for another place to eat. Since 1976, the Cripple Creek & Victor Gold Mining Company(CC&V) started conducting gold mining operations at their Cresson Mine, an open pit mine near Victor. For the past three years, the company has offered two-hour tours daily except for Thursdays at 10 a.m. and 1 p.m.. They take place on a 13-passenger bus. The tour starts at the Lowell Thomas Museum where we watched a safety video, picked up hard hats (others got safety glasses), and signed an injury release form. On the way to the first stop, our driver, Roxie, pointed out the mines we passed such as the Independence Vindicator, and American Eagle. She also related the history of Victor and Goldfield. She said the Cresson’s goal is for complete reclamation once the mining ceases. They plan to plant trees and grass and return the area to looking the way it was before it was mined. All land they are on is private. Colorado’s Department of Public Health and Environment has honored CC&V as a Gold Level Leader in their Environmental Leadership Program. The CC&V is the first mine in Colorado to qualify for this honor. We learned miners dug 92 miles of underground tunnels and blasted more than 2, 000 prospector holes during the days when they followed veins. The Cresson labor staff no longer seeks veins. 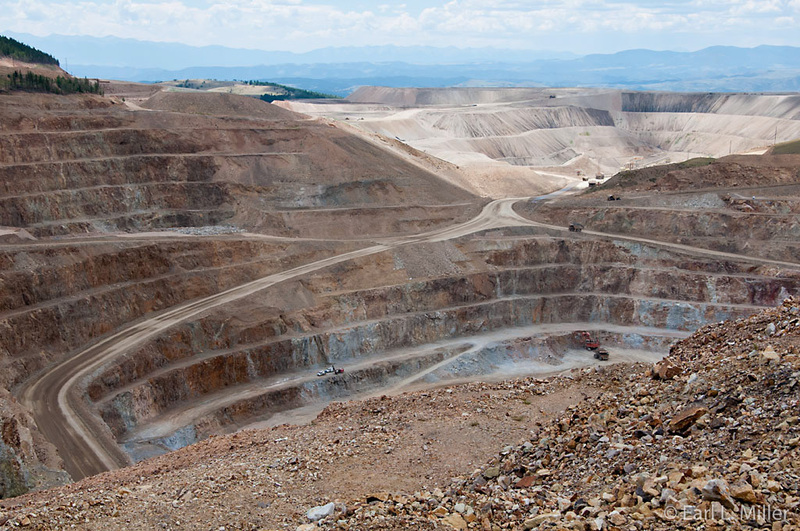 Instead they perform surface mining 365 days a year, 24 hours a day at what is Colorado’s largest mine. Only fog temporarily shuts down the work day. They monitor the dust, light, noise, and vibrations. Staff works 12 hour shifts. The crew numbers 475 with 10% being women. The ladies are among the employees who run the trucks and operate the loaders. After obtaining permits from regulatory agencies from local to federal, the CC&V removed all trees and grass from the area they were going to mine. Then they did an exploratory drill to find out how much gold was in a ton of rock. It was 3-1/2 ounces. On our first stop , we saw an overview of the mine and learned about the mining process. The current cut dates to 1995. The company blasts are more of an implosion process as they fracture the ground breaking the rock. Blast holes are approximately 40 feet deep and 16 to 22 feet apart. Then they scoop out the earth. The broken rock called muck is surveyed and marked with flags that indicate gold-bearing ore and non gold-bearing rock. It is then loaded into dump trucks hauling 250 to 300 tons and transported to the crusher if it contains gold. If it doesn’t contain enough gold, it goes to a slush waste pile, on the other side of the mine. It will remain there until gold reaches a profitable price of $1800 an ounce. The scrap area is currently worth a half a million dollars. The indication for gold is fluoride. The area is like a caldera (the crater of a volcano). Gold came because of a hydro thermal event - arriving through fissures and then dissolving in water. Silver is also mined but not manganese since there isn’t enough of that mineral to be profitable. For our next stop, the bus drove to the mine’s floor where we actually saw the trucks loaded with rocks. They are currently replacing the 300-ton trucks with Caterpillar 250-ton trucks. The 300-ton trucks aren’t as efficient and are subject to breakdowns. The 250-ton trucks take 1200 gallons of diesel - topping off at the end of every shift. Two shovels fill the trucks with 40-45 buckets at one time. The loader operator honks one time for the rock to go to the gold crushers, two times to go to the waste pile, and three times for the mineral stockpile. As one truck leaves, another arrives. Thirty trucks haul rocks at any given time. In 1914, miners broke into a room 1200 feet below the current mine. This was known as the “Cresson Vug.” A vug is a cavity in the rock lined with crystals somewhat like a geode. This vug produced 60,000 troy ounces of gold picked from the walls of a room-sized void. The hall was 20x15x28 feet. Today that gold is worth $96 million. We stopped next at the crushing facility. The goal is to crush 70,000 tons a day which the mine is currently exceeding. There are three crushers. The first breaks the ore into six inch or smaller pieces. Magnets are applied at the second crusher to gather the metal from old mining operations and protect equipment. After the third crusher, rocks are down to a 3/4 inch or smaller size. They are sent from one crusher to another by conveyor belts. the Valley Leach Facility. At the load out bin, pebble line is added to ore to raise the pH and increase the process solution’s effectiveness. We learned at this stop about leaching. Leaching beds are all around the crusher. Cyanide is applied in drip irrigation tubes buried under the crushed rock surface to dissolve the gold. It’s 100 parts cyanide to a million parts water. It takes 120 days for the rocks and cyanide to drip down into the bottom of a pit lined with rubber. They pump out the cyanide solution that contains water and dissolved gold and silver and send it to a recovery plant to remove the gold. Leaching occurs from the outside rather than the inside of the rock - a process which leaves about 30% of the gold in the rock. At the recovery plant, the gold and silver are attached to carbon made from processed, crushed coconut shells. Then the gold and silver are chemically removed from the carbon by a Strip vessel and solution wash. This creates a concentrated solution. The carbon is recycled. The dissolved gold and silver are removed from the concentrated solution and formed into a mixture that looks like mud. The gold and silver laden mud are poured into cone-shaped molds Impurities solidify on top with dore buttons on the bottom. The buttons are 65% gold with the balance being silver. Dores are then shipped to a specialized refinery for further processing. 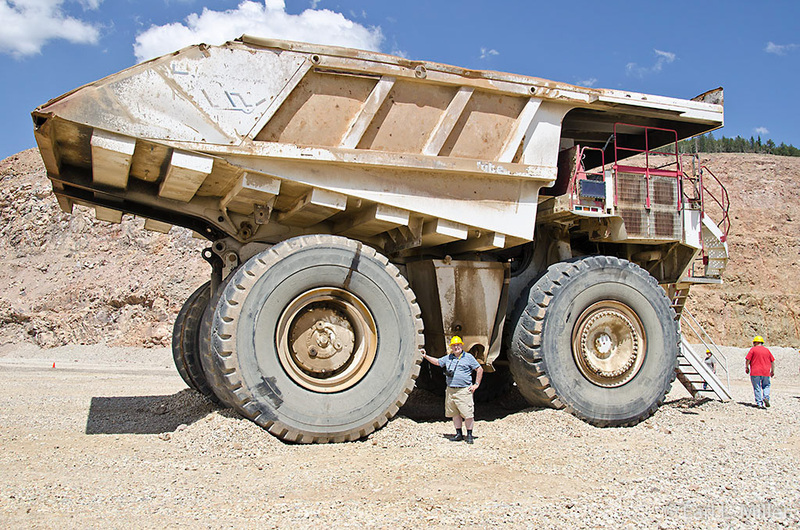 We stopped at an area where we could view a 300-ton hauling truck up close. The tires on this truck cost $37,000 and weigh 10,000 pounds each. Those who wished were allowed to climb on the truck. On our return to Victor, we passed the area where maintenance is performed and where their security/administration/geology building is located. It’s called the dry. In the early days of mining, the miners would return, at the end of their shift, totally soaked with dirt and mud. They had to strip and were searched to make sure no gold or silver was being carried out in their clothes. We returned to Victor passing Grassy Valley which has been replanted, where the town of Cameron stood, and the former Hoosier Mine. We also learned more Victor history. I strongly recommend this tour which is worth more than the $7.50 price they charge. It is vital to make reservations a minimum of three to four days in advance. You can reserve online or call (719) 689-5509. Google Gold Mine Tours - Victor, Colorado to see how many people have signed up each day for the tour. We are leaving Colorado Springs on Wednesday and moving to a West Pueblo Campground for a week to ten days. Plans after that are indefinite.